Buddileigh Farm in Betley, near Crewe sleeps 8 people. This spacious, semi-detached holiday property features 17 acres of wonderful garden leading down to a pond with resident swans. Visit Bridgemere Garden World, the Hack Green Secret Nuclear Bunker or Stoke-on-Trent with the famous Potteries, and Alton Towers. The historic town of Nantwich is also close by. Golf 1 mile. Monkey Forest, 11 miles. Shop 1 mile, pub ½ mile, restaurant 1½ miles. Ground floor: Living room with beams and wooden floor. Kitchen with breakfast area, beams and tiled floor. Utility. Separate toilet. First floor: 3 bedrooms: 2 double, one (5ft) with en-suite shower room and toilet, 1 twin. Bathroom with roll-top bath and toilet. Woodburner in living room included. Oil central heating and electric heaters included (extra charge November - March). Electric, oil, bed linen and towels included. Travel cot and high-chair on request. Two satellite TVs. DVD. Oil Aga. Combi m/wave/oven/grill. Washing machine. Dish washer. Fridge/Freezer. Private terrace with furniture. 17-acre lawned garden shared with owners. Balcony with furniture. Barbeque. Ample parking. Cycle store. No smoking. Holidays run from Friday to Friday. NB: Unfenced pond in garden 50 yards. For a better idea of where Buddileigh Farm is, you can see Buddileigh Farm on the map below. Buddileigh Farm is in Cheshire; should you be on the lookout for a special offer, you can find all the special offers in Cheshire. It's always worth checking to see what is on offer at the moment. 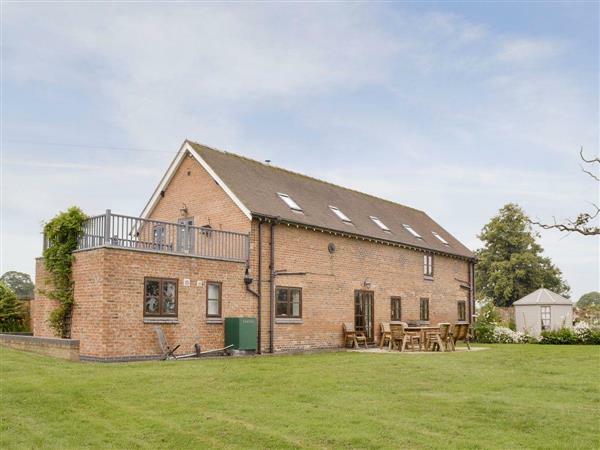 Do you want to holiday near Buddileigh Farm (26951), you can see other cottages within 25 miles of Buddileigh Farm; have a look to find your perfect holiday location.